Thirty years ago, little Analisa Calderon sat on the carpet of a Minnesota kindergarten classroom and listened to her teacher give instructions in Spanish. Calderon, now a Seattle physician, was attending an early version of a Spanish immersion class. Today, this is called a two-way dual immersion program, meaning that some of the children are native Spanish speakers, some are bilingual and some come from English-only homes. Some programs teach in English for half the day and the other half in Spanish. Other programs are almost entirely Spanish in kindergarten and first grade. The goal is to have all children test at grade level in both languages by third grade. While Spanish is the most common language taught in these programs, some schools focus on other languages such as French and Mandarin. Calderon credits her early immersion experience with allowing her to quickly grasp Spanish. After studying the language in college, she not only speaks it fluently, but reads and writes in Spanish as well. It comes in handy now that she’s a family physician at Sea Mar Community Health Centers in Seattle, where the majority of her patients speak Spanish. Bilingual skills such as these are in high demand, and schools and educators are finding ways to equip students with these capabilities. Studies show that studying a foreign language helps academic performance across subjects, narrows achievement gaps and enhances cognitive development. Farin Houk, a cofounder and head of school at Seattle Amistad School, saw the gap between the demand for bilingual professionals and programs that teach students a second language, as well as the frustration of native Spanish speakers in English classrooms. Houk, a former public school teacher, saw a system that tried to quash the native Spanish speaker’s first language, while also trying to develop a Caucasian native English-speaking middle- to upper-class group of bilingual students. To her, this double-headed problem had a “no-brainer” solution. Houk opted to start her own school to serve a mix of native Spanish-speaking, bilingual and native English-speaking students. The first cohort started in kindergarten and is now in third grade. The Spanish/English mix varies per grade. Prekindergarten through first grade is taught entirely in Spanish. By second grade, students transition to math in English. In third grade, 30 percent of class is taught in English; the other 70 is in Spanish. For the next year, when the oldest group moves to fourth grade, instruction will be 50/50. Children can start the Amistad program as young as 3 years old, Houk says. Parents sometimes wonder if their children won’t learn as much because they will be confused. But that doesn’t seem to be the case. Research has shown that the earlier children are exposed to languages, the better their chances of retention and proficiency. Studies also show that studying a foreign language helps academic performance across subjects, narrows achievement gaps and enhances cognitive development. Teachers understand that children can’t speak the language when they walk in, so they use plenty of visual cues to help students along, Houk says. “It’s just amazing what kids can do when we get out of their way,” Houk says. Recently, one of Houk’s 3-year-old students, a native English speaker, had a situation with another student. When the little girl explained the problem to Houk, she did so in Spanish. Although that little girl did not speak Spanish when she started school in the fall, she is already capable of relating a situation in her second language. A number of Puget Sound–area public school districts and schools have implemented language immersion programs. This spring, the Washington Association for Bilingual Education held its 2016 conference in Bellevue and highlighted some of the local dual immersion efforts. and one school has a Mandarin program. The programs are so popular that many parents of incoming kindergartners at Lake Hills Elementary request that their kids be in a two-way dual immersion program, and there are waiting lists, Brown says. The district tries to keep a 50/50 balance between native Spanish- and English-speaking students in the classes. Teaching young children in their native language as well as a second language all connects to the district’s mission of providing students with exemplary college preparatory education. And the two-way model benefits speakers of each language, Brown says. The English speakers have their Spanish-speaking peers to model the language and vice versa. Kristin Percy Calaff, director of language learning at Highline Public Schools, sees a similar trend. The district offers dual immersion in both Spanish and Vietnamese. Highline realized the importance of bilingualism and included it in its strategic plan, Calaff says. Finding educational tools in Spanish, such as books, and instructors qualified to teach in Spanish are two obstacles many schools face. Calaff is also a parent to fifth- and seventh-grade students, both of whom are in dual immersion. Parents interested in dual immersion should consider whether or not it’s a good fit for their child. For example, a parent won’t be able to help their student with every piece of homework. Calaff feels that she’s giving her children an early head start on becoming bilingual, but it will be up to them if they want to pursue it in the future. “They will have the early roots if they want to go back to it later,” she says. The experience of being introduced to two languages makes you a language detective. You start becoming more aware of language and the elements of language. Motivating children to truly immerse themselves in a language that isn’t spoken in their own community can be challenging, says Tara Fortune, a director at the Center for Advanced Research on Language Acquisition at the University of Minnesota. 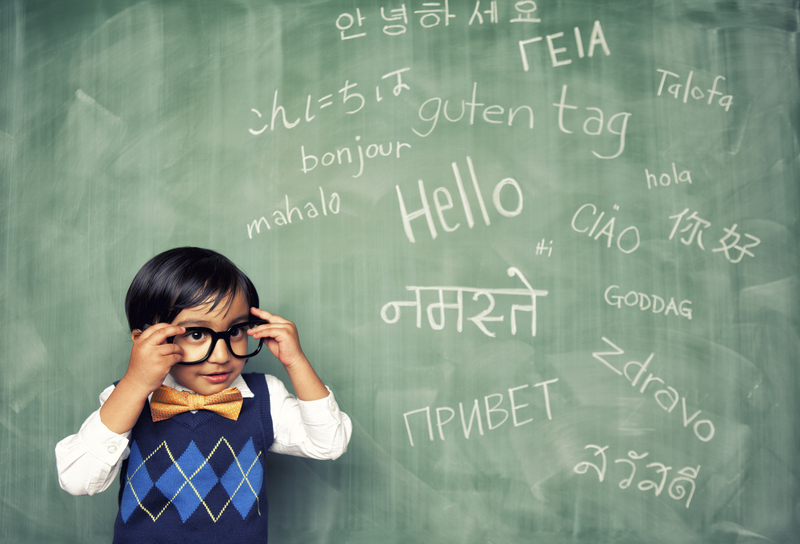 “Getting kids to invest in that new language is the trick,” Fortune says. Those who enter the United States from other countries see the immediate value of speaking English. “There is a perception that English is a valuable asset economically, politically and professionally, so there is a lot of status and motivation to learn the language,” Fortune says. Calderon hopes that the growing trend of dual immersion will encourage native language speakers to hold on to their original language, while learning English as well. Shawna De La Rosa is a mother of three boys. When she's not driving one — or all — of them to a practice, she writes about everything from education to the economy, the stock market to small business. Is My Kid Too Young for a Cell Phone?